Being pregnant is a blessing but childbirth will never be easy for every woman who experiences it. However, some men think that having kids is an easy feat which is why one husband who told her wife that having four kids was “easy” was left to eat his words after experiencing the pain of contractions. Michael Richardson, a husband and a father of four from Gran Canaria agreed to be hooked up to a device that would stimulate contraction pains for him to finally have a taste of what he thought was “easy.” His wife Jodie who has been married to him for 12 years decided that it would be the best time to record this hilarious experiment. 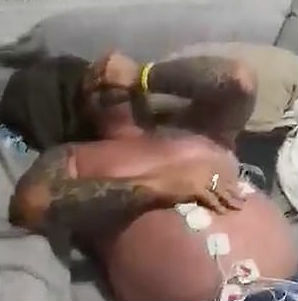 In the viral clip, Michael can be seen writhing in pain as he is being stimulated with contractions as it grows stronger and stronger. Jodie can be heard telling him that she has decided to show Tax what it would be like to experience period pains and what every woman experiences during childbirth. Her husband lasted for a couple of seconds before he started pulling at the electrodes connected to his stomach. He was kicking his legs and begging his wife to “stop” and telling her to get it off. Michael and Jodie purchased one of these machines after Michael’s physical therapist advised him to buy one to help him with his muscle pain caused by a knee injury. This was Jodie’s idea to hook him up because he keeps on telling her that having a baby was easy. “It’s only period pain, get over it,” he said. 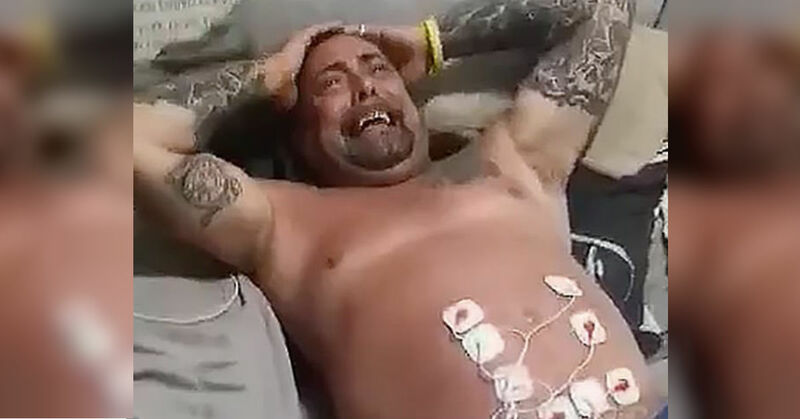 After getting a short glimpse of the pain that women experience during labor, this 47-year-old husband immediately took his nasty comments back after he had first-hand experience what he described as being stabbed in the groin. He changed his opinion on what his wife has gone through four times. He also admitted that he would never put himself through the pain again. He also added that when his wife hooked him up to the machine, he had no idea what would happen next. “I didn’t believe the pain that women go through in childbirth,” he shared. Michael admitted that he honestly do not know how women do this. Jodie even told him that the pain that this machine stimulates is nothing compared to how it really feels in reality. Jodie decided to share this online and the couple’s friends praised Michael for giving the machine a try before he started joking that he should stop acting like a baby after a few minutes of pain which is nothing compared to the hours that women have to endure. This revelation is only a proof that there are areas where women can be stronger than men. Nothing can compare to the joy and happiness that women feel once they learn that they are pregnant. They know that giving birth can be very painful, but all of the sufferings will all be worth it once you have your healthy baby in your arms.